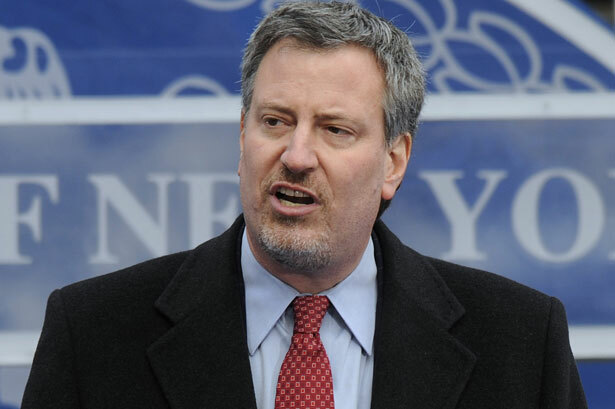 Good news, for once: Bill de Blasio’s recent surge in the New York City Democratic mayoral primary tells us that, moribund as it may have appeared in recent years, economic liberalism in America is not dead yet. True, it looked to be buried alive until recently, beneath not only exploding economic inequality but also liberals’ own myopia. Nowhere has this pattern been more evident than in the world’s greatest city, where, in the eleven years since billionaire mayor Michael Bloomberg took office, the top 1 percent have garnered a third more of the city’s income than they had before, and where today nearly half of its residents qualify as poor or near poor. Bloomberg, of course, is totally cool with this. The same mayor who set the cops on Occupy Wall Street, and threw hundreds of people legally and peacefully protesting the 2004 Republican National Convention in jail, elected to pay a solidarity call to Goldman Sachs CEO Lloyd Blankfein on the day after the poor fellow found his bank criticized by a former employee on The New York Times’s op-ed page. Quizzed on these issues, Bloomberg Deputy Mayor Howard Wolfson told The New Republic: “I guess I’m more concerned about mobility than inequality. I’m more concerned about poverty than inequality. To me, inequality is a political argument….” Bloomberg’s mixture of social and cultural liberalism and economic conservatism is almost perfectly mirrored in Albany, where Democratic Governor Andrew Cuomo has led the push for gun control, gay marriage and women’s rights but has proven a “bulldog for the wealthiest,” in the words of local columnist Michael Powell. Someone send Frank Sinatra the news that this great city sometimes feels like one big party for plutocrats, with the rest of us invited only to cater and clean up afterward. True, de Blasio has some unique selling points in this campaign. He is by definition an “outer-borough ethnic,” which blunts the easy anti-“elitist” attacks on liberals found regularly in the pages of billionaire Rupert Murdoch’s New York Post and billionaire Mortimer Zuckerman’s Daily News. Having a wife who is African-American and a former lesbian activist and a son with a gravity-challenging Afro puts a massive kibosh on the kind of identity-politics demands that have too often doomed Democratic candidates with broad electoral appeal. De Blasio is, according to the most recent polls, winning with blacks and women, despite the presence of both in the race (I don’t know about lesbians). Moreover, he has succeeded in uniting these constituencies through an inclusive class-based appeal, one that is bolstered by the fact of his being the only serious contender in the race whose kids attend our public schools. Together with his hardline opposition to Bloomberg’s illegal stop-and-frisk obsession, de Blasio has credibly positioned himself as the voice of those who, in Bloomberg’s New York, had been silently shunted off to the sidelines. The city’s elites understandably expected an easy victory for Christine Quinn: How hard should it be to get the lesbian City Council speaker elected mayor when you have the support not only of the billionaire incumbent, but also the real estate and financial industries? And so the scare tactics have only just begun. Wolfson warns of the potential flight of the wealthy from the city, which he asserts is “already the highest-taxed jurisdiction at the high end in the country…. You can raise the price, and people could decide it’s not worth it anymore.” But in fact, there is virtually no social scientific research to support this oft-heard prediction. And the city’s progressive public campaign-financing system prevents the kind of carpet-bombing operations conducted by Koch brothers– and Sheldon Adelson–funded groups elsewhere in the country. In Los Angeles, Eric Garcetti recently won a mayoral campaign fought on similar lines, buoyed by the Los Angeles Alliance for a New Economy, an inspirational model for local empowerment of working people artfully described by Harold Meyerson in The American Prospect. Together with de Blasio’s brilliant campaign, they provide economic liberalism not only with eloquent and unapologetic voices, but also inclusive and reproducible models of victory. This is particularly true now that demographic trends—both the ethnic and racial composition of the electorate as well as the “live and let live” libertarianism of younger voters—allow them to transcend the internally divisive, culturally driven arguments of the past. Read The Nation’s endorsement of Bill de Blasio for mayor of New York City.